Sb 3d5/2 binding energy values . Curve-fitted Sb 3d XPS spectrum. A) Doublet separation for Sb 3d5/2 - Sb 3d3/2 = 9.38 +/- 0.08 eV (5 Cit.). specifies a doublet separation of 9.34 eV. B) Sb 3d5/2 overlaps with the O 1s spectrum. Need to fit and constrain the Sb 3d5/2 and Sb 3d3/2 peaks using the 3d3/2 peaks as a guide. Remaining area in the 3d5/2 area will be due to O 1s signal. 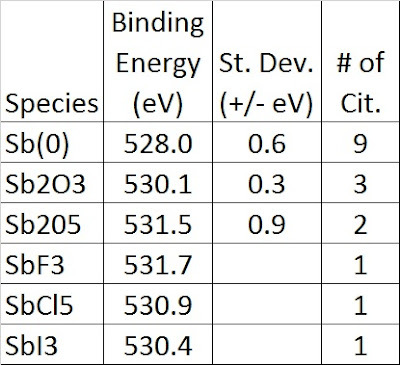 C) Sb2O3 standard samples has Sb 3d5/2 at 530.1 to 530.3 eV. Sb2O5 standard sample at 530.9 eV. 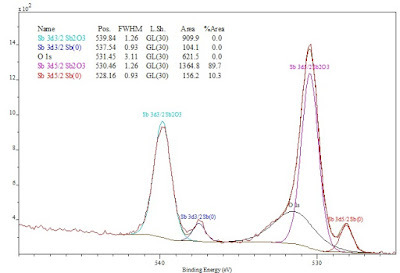 D) Sb2S3 standard sample (Stibnite mineral sample) has Sb 3d5/2 peak at 529.6 eV. S 2p3/2 at 161.2 eV. 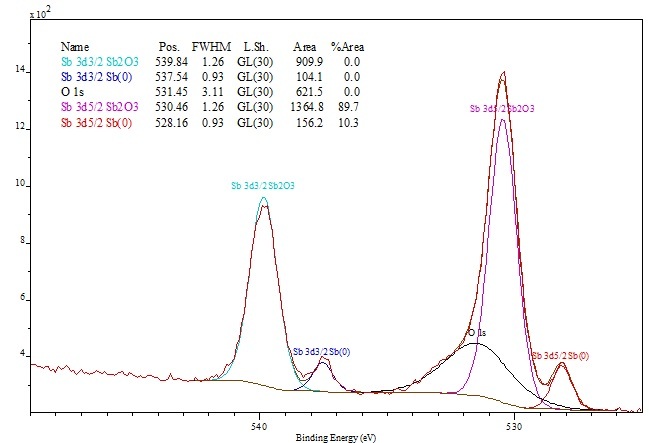 E) KSbO3 standard sample has Sb 3d5/2 peak at 530.7 eV. K 2p3/2 at 292.8 eV.